The CSU system uses PeopleSoft Finance as their accounting software. It is sometimes called CFS, short for Common Financial System. PeopleSoft Finance has been configured for the CSU structure to manage funds, budgets, reporting, etc. through the use of chartfields. All employees need to have a basic understanding of the Stanislaus State’s chart of accounts because all financial transactions and activities (e.g., buying and paying for things, getting reimbursed for business and travel expenses, managing funds, etc.) utilize this accounting structure. Five-digits, alpha numeric. Identifies funding that has a specific defined purpose. Five digit numeric. Identifies a unique department within the University organization. Can also be used to identify a major program within a department (e.g., utilities). Three to five digits, alpha and/or numeric. Defines minor on-going activity that is related to a specific department. If you will be submitting purchase requisitions and/or running departmental financial reports, you will need access to PeopleSoft Finance (also known as CFS). Your supervising manager will assist you in preparing the Office of Information Technology Security Request Form. The fastest payment method is Electronic Fund Transfer (EFT). EFT payments are processed twice a week. Check payments are processed once a week (student checks twice a week). Financial reports are built by pulling data from PeopleSoft/CFS Data Warehouse. The Data Warehouse dashboards that will be the most meaningful to you Manage My Budget and Operations. You can obtain Revenue and Expense reports, Fund Balance, Open Purchase Orders, Cash, etc. The Data Warehouse Management Report has features that make it easy to produce custom management reports for a variety of Auxiliary organization and campus needs. You will need to request access to PeopleSoft Finance Reporting. Stanalytics is the Stanislaus State enterprise data warehouse, which is a collection of reporting tables and reporting tools that are specifically structured for querying and analysis. This collection of reporting tables and tools combines data from various data sources, some of which includes the PeopleSoft Student, Finance, and HR systems. Using these various reporting tools and reporting tables, users can create and execute various types of tabular and analytical reports for operational and executive decision making. Stanalytics contains both historical and current data which is reprocessed nightly, and also contains snapshots of data for specific point-in-time analysis (ie: census). For more info and instructions on how to run reports go to http://reports.csustan.edu. The speedchart in PeopleSoft Finance is used to simplify data entry by eliminating key strokes. It is a "shorthand" number linked to a unique set of Chartfield combinations to ensure that expenses are properly charged to the General Ledger. It is a ten character "shorthand" alpha-numeric value linked to a unique set of Chartfield combinations: for general accounting must include the Fund code and Department ID; for grants must include Fund code, Department ID, and Project code. Departments using any of these services will need to set up a speedchart for each expense account being utilized. Transactions under $10,000 can be approved by the appropriate College Dean, Assoc./Assist. Vice President, or Vice President (exceptions for Grants and Trusts). State law and relevant California State University policy require that all money received for goods, services, or donations by the University, or any entity connected with the University be deposited in accounts approved by the University's Chief Financial Officer (CFO). The Chief Financial Officer (CFO) is required to open and maintain bank accounts within the CSU centralized banking system in accordance with CSU policy. Centralized banking is currently with Wells Fargo. Bank accounts cannot be established by University departments or individuals. 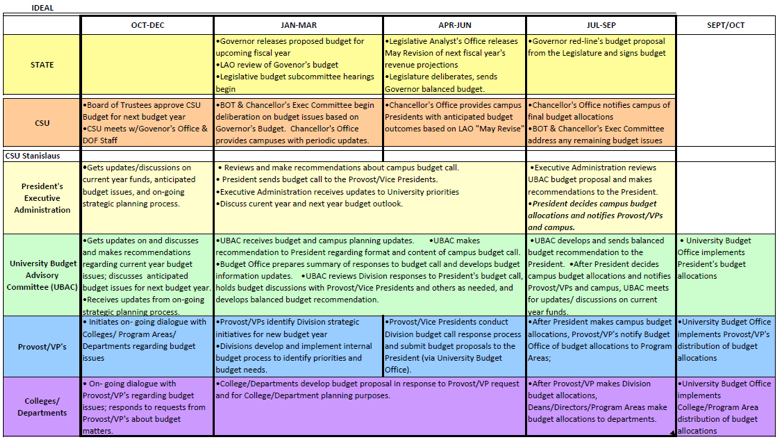 The University Budget Office exists to provide budget planning and analysis for the University; to ensure both the short term and long term fiscal integrity of all funding sources; to provide guidance in interpreting federal, state and CSU policy regarding expenditure authority; to provide and execute a budget planning schedule for the campus; and, to support the budget information needs of the campus community. The CSU system operates on the same fiscal year as the State of California: July 1 through June 30. The University Budget Advisory Committee is a campus-wide advisory committee to the President charged with advising the President on financial planning and budget allocation matters based on the University mission and strategic plans. Members appointed to the UBAC have primary responsibility to represent the entire campus (faculty, staff, students and administration) in supporting the campus mission with particular attention to division level budgets. Members of UBAC receive their assignments through direct communication from the chair of UBAC. In Business & Finance, we recognize that together we share the responsibility and work involved in conducting the campus' day to day business operations. The Business Analyst Forum is made up of a group of individuals who all have important roles to play to ensure the full scope of the University's operational needs are met. Our goals are to: improve campus business processes, identify and address business operations training and information sharing issues, and insure that business operations communication channels are open and available. We believe that by working together we can solve any business problem that arises on campus. Departments complete the request form at year end with an expenditure plan for the following fiscal year to request a one time carry forward of general fund restricted and Lottery funds. Payroll expense adjustments are utilized to move a prior month expense to one or more different funding sources. Position Control is assigning and maintaining a position in the University funding. Position control is handled in the budget office. All documents requiring position control authorization must be signed by the Budget Office. The Special Consultant classification, Class Code 4660, is to provide payment to individuals who perform special assignments of limited duration and no other appropriate classification is available. The Special Consultant process should be avoided when regulations and the situation permit in favor of 1) an independent contractor agreement for services 2) a guest lecturer/honorarium form or 3) regular temporary faculty, management or staff employment procedures. The California State University requires that the President and the Chief Fiscal Officer (CFO) ensure that costs incurred by the CSU Operating Fund (related to state-supported instruction) for services, products, and facilities provided to other CSU funds and to Auxiliary Organizations are properly and consistently recovered with cash and/or a documented exchange of value. Allowable direct costs incurred by the CSU Operating Fund shall be allocated and recovered based on actual costs incurred. Allowable and allocable indirect costs shall be allocated and recovered according to a cost allocation plan that utilizes a documented and consistent methodology including identification of indirect costs and a basis for allocation. The California State University (CSU) and its universities and auxiliaries are subject to a variety of audits including annual and periodic audits in compliance with Government Auditing Standards. The most common audit is a system-wide financial audit in accordance with Generally Accepted Accounting Principles (GAAP) and standards set by the Federal office of Management & Budget. Each campus performs audit fieldwork directed by an external audit firm engaged by the CSU’s Office of the University Auditor (OUA) to collectively report CSU results to the Bureau of State Auditor’s annual single audit of the general purpose financial statements included in the State Controller’s Office Annual Report to the Governor. Auxiliary organizations are required by California Education Code, Title V, Section 42408 and Nonprofit Integrity Act of 2004 to have an annual fiscal and internal controls audit performed by certified public accountant selected by the auxiliary organization. Other external audits may consist of, but are not limited to, those that are requested by the State Controller’s Office, the State Department of Finance, the Bureau of State auditors, the State Board of Equalization, the Internal Revenue Service, and granting agencies. The OUA routinely performs CSU internal audits of specific campus operations based upon an annual risk evaluation. These special area audits entail review of internal controls and operational processes relative to specific programs or projects. The OUA also administers an auxiliary audit program on behalf of the CSU Board of Trustees to provide additional oversight of auxiliary organizations. The Chancellor, through various Executive Orders, has delegated financial, administrative, and management responsibilities to the President of each campus. Local delegation of the authority and responsibility for centrally managing all aspects of campus audits has been made to the Vice President, Business and Finance, and his designee the Associate Vice President, Financial Services. Financial audits examine the accounting and reporting of financial transactions. The auditor reviews controls over the receipt and disbursement of funds, the safeguarding of assets, and the recording of transactions in accordance with Generally Accepted Accounting Principles, or GAAP. Internal Control audits are a specialized type of audit that focus on the internal control environment of automated information processing systems and are typically conducted by the Office of the University Auditor. Investigations are conducted when there is a suspicion or allegation of fraud, embezzlement or waste. Investigations involve the examination of records and interviews of employees to determine if any illegal activities have taken place, which if proven, normally lead to disciplinary action and/or criminal prosecution. Control processes are the policies, procedures, and activities that are part of a control framework, designed to ensure that risks are contained within the risk tolerances established by the risk management process. Risk management is a process to identify, assess, manage, and control potential events or situations to provide reasonable assurance regarding the achievement of the organization's objectives. Internal control is a process, affected by an entity's board of directors, management and other personnel, designed to provide reasonable assurance regarding the achievement of objective in the effectiveness and efficiency of operations, reliability of financial reporting, and compliance with applicable laws and regulations. Preventative Controls: Designed to discourage errors or prevent irregularities from occurring. They are proactive controls that help prevent a loss. Examples: Separation of duties, proper authorization, adequate documentation, and physical control over assets. Detective Controls: Designed to find errors or irregularities after they have occurred. Examples: Reviews, analyses, variance analyses, reconciliations, physical inventories, and audits. Control Environment: This sets the tone of the organization and is the foundation for all other components. Risk Assessment: Management establishes activity-level objectives and mechanisms for identifying and analyzing risks related to their achievement. Control Activities: Polices and procedures that ensure management's directives are carried out and help ensure that necessary actions are taken to address risks to achievement of the entity's objectives. Information and Communication: Information identified, captured, and communicated in a form and timeframe to enable people to carryout their responsibilities. Monitoring: The process that assesses the quality of the system's performance over time, which includes ongoing monitoring activities, separate evaluations or a combination of the two. The internal audit activity evaluates the adequacy and effectiveness of controls encompassing the organization's governance, operations, and information systems. Internal audit reviews include the reliability and integrity of financial and operational information, effectiveness and efficiency of operations, safeguarding of assets, and compliance with laws, regulations, and contracts. These reviews also ascertain the extent to which operating and program goals and objectives have been established and conform to those of the organization, as well as the extent to which results are consistent with established goals and objectives and whether operations and programs are being implemented or performed as intended. Auxiliaries are legal (nonprofit corporations) business entities that have been established and organized by the CSU pursuant to the California Education Code. An auxiliary’s primary purpose is to support the university mission by providing programs, activities, fund source used to furnish facilities, goods or services to faculty, staff, or incidentally to the public. Even though they are corporations, they are first and foremost auxiliary organizations of the CSU and must therefore operate pursuant to the specific statues and regulations applicable to auxiliary organizations. The campus CFO is the single campus officer designated to ensure auxiliaries maintain sound systems of internal controls and remain in compliance with legal and regulatory requirements, including nonprofit law. All Auxiliary financial transactions are handled in the same manner as University financial transactions.